“Chill-ax!” Ever been told that before? Easier said than done, for sure. Well now you really can chill out and relax with Stress + Calm homeopathic formula. 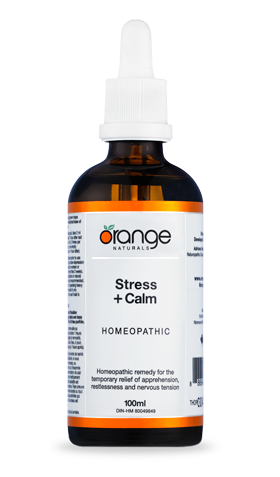 Orange Naturals Stress + Calm will help you find temporary relief from the stress of daily life. It is a supportive remedy complex that helps melt away apprehension, restlessness and nervous tension. It’s a healthy way to decompress – a mini vacation in a bottle! Homeopathic remedy for the temporary relief of apprehension, restlessness and nervous tension.